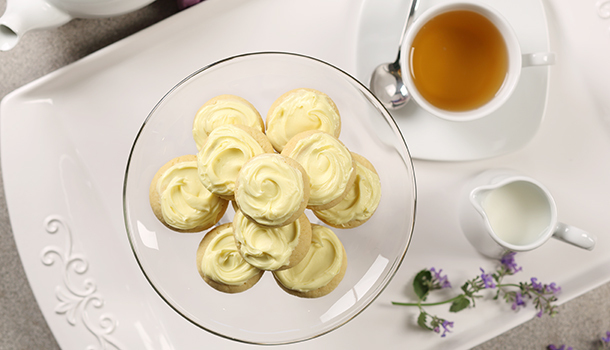 Add a little sunshine and make these everyday drop cookies - soft and lemony! The tangy zip of the lemon zest and Odyssey Greek yogurt will have your family asking for more. Add a little sunshine and make these everyday drop cookies - soft and lemony! Place oven rack in center of oven and preheat to 350⁰F. Line 2 large rimmed light-colored cookie sheets with parchment paper; set aside. To prevent cookie bottoms from over browning, set the parchment lined cookie sheet inside a second unlined cookie sheet. Baking with stacked cookie sheets gives needed insulation. In a medium bowl, whisk flours, baking powder and salt; set aside. In a large bowl, use an electric mixer on medium speed, beat butter, sugar and vanilla about 2-3 minutes. Add Greek Vanilla Yogurt, lemon zest, lemon juice and food color; beat until combined. Reduce speed to low and add dry ingredients in two batches, beating well after each addition. Roll dough into 1-inch balls and place on prepared cookie sheets. Using thumb, press each cookie middle about halfway down. Bake one cookie sheet at a time until done, about 18 minutes. Cool on a wire rack and generously ice with lemon frosting. Store in an airtight container.